The Show Floor Is Open! 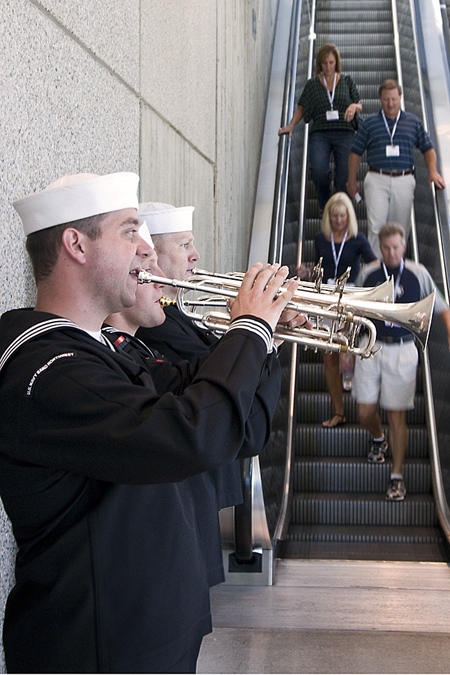 The 2013 NECA Show opened immediately after today’s Opening General Session with Gen. Michael Hayden. 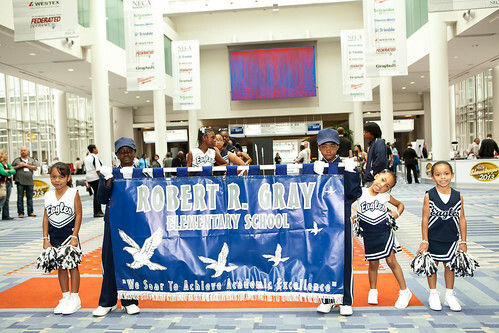 Fanfare was provided in classic D.C. drumline style by drummers, pom squad and color guard from the Robert R. Gray Elementary School Eagles. 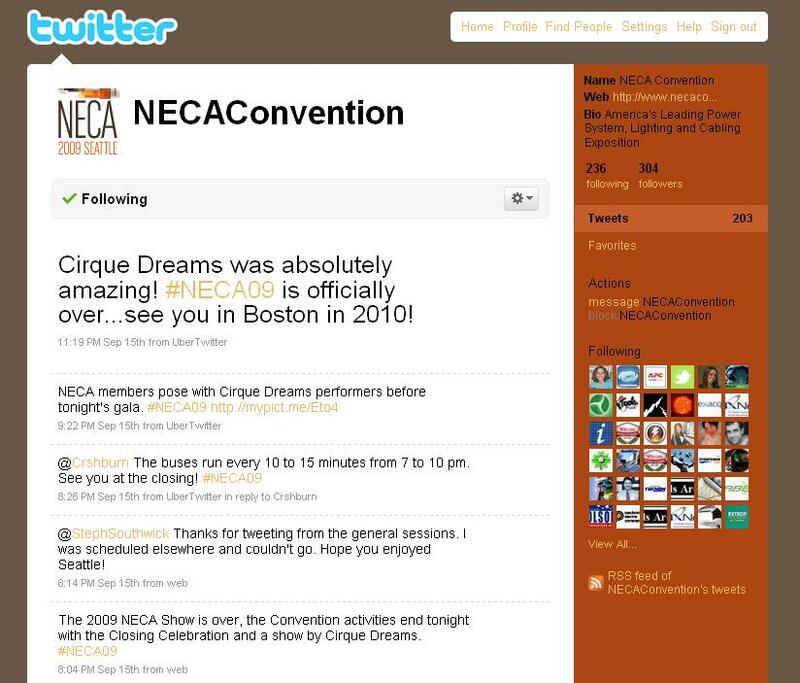 Check out some of the great exhibits and product demos from the first day at the 2013 NECA Show on our Flickr feed. Where’s the NECA Store? On the Show Floor! We’re thrilled to announced that our first-ever NECA Show Construction Zone will be sponsored by Rexel, a leading distributor worldwide of electrical supplies . The Construction Zone will be the prime location for catching your breath and taking in all that’s available on the NECA Show floor. This central networking lounge will be decked out in the familiar signs of a working jobsite, but the Construction Zone will actually be the best place at NECA 2010 Boston to take a break. The Construction Zone will be the perfect spot to grab something cool to drink at the cash bar, check email with free wi-fi, have a quiet conversation, catch up on the scores from Sunday’s NFL games, or tweet about your favorite NECA Show booth. During exhibit hours on Monday, Oct. 4 and Tuesday, Oct. 5, the Construction Zone will display product DVD’s, demos and other excellent features. Rexel is making a splash with their sponsorship of the Construction Zone at the 2010 NECA Show, returning as an exhibitor after several years and requests from Show-goers to share their latest services. Rexel will also have a full display at NECA Show booth #141. First, I’d just like to say that I’m not an electrician, nor do I play one on TV. But as a graphic designer, I’m attracted to all things bright and shiny. And when I heard that Philips Color Kinetics was presenting a hands-on pre-convention workshop on LEDs, I had to take a look. 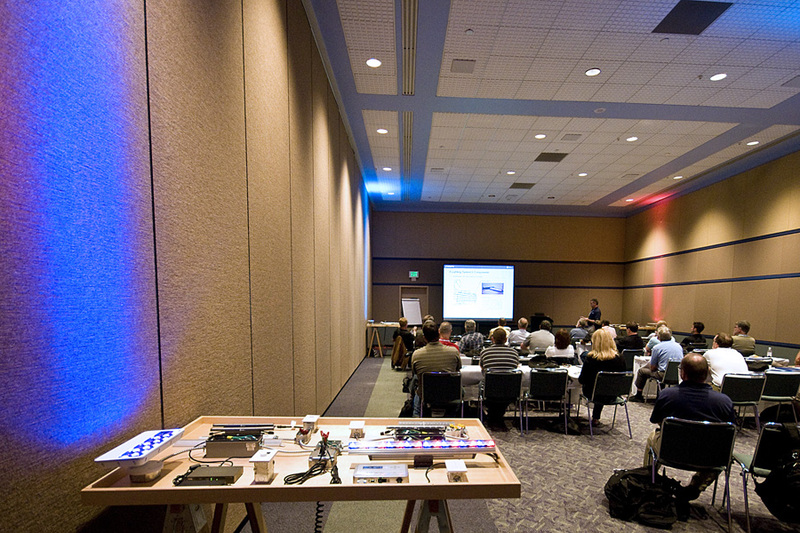 Their room was set up with four boards with working samples of LED installations. After the Philips staff talked about the products, we got to see how things work up close. Eden and Scott, the workshop leaders from Philips, were nice enough to walk me through one of the boards, and I’m happy to say that bright and shiny can also be practical and energy-efficient…and really, really cool. The first half of the board was set up with white lights. The eW Profile Powercore and Cove Powercore have white LEDs at the temperature you select. The lights come right on with no warmup time when you flip the switch, and there’s no annoying flicker. They can be strung together to light large areas or installed one-by-one to provide task lighting. That’s fun, but a white light is a white light. So we moved on to the iW Cove Powercore. With this fixture, you can mix the cool and warm white lights to create the color temperature you want. It’s dimmable, too. Even better, when it’s attached to the iW Scene Controller, you can save different settings and then bring them back by just touching a button. You don’t realize how much of a difference choosing the right white temperature makes until the “shades” are right in front of you. On the other side of the table were the lights that had attracted me in the first place: the ColorBlast Powercore. Big, bright RGB LEDs that can light interiors and exteriors and when hooked up to the ColorDial Pro, are programmable so you can save several light shows and play them again later by touching a button. Now that you know how much I love the bright and shiny, you can understand how the notion that itty bitty light bulbs can make a bridge look like it’s dancing fills me with joy. 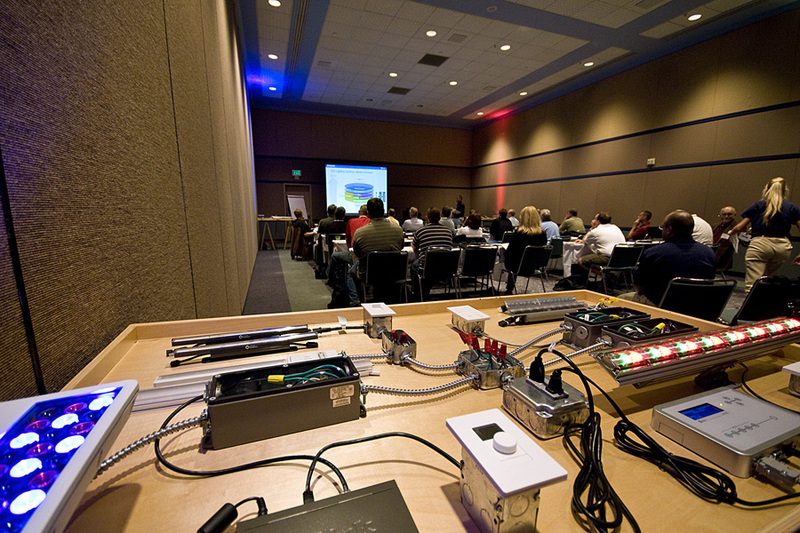 The boards used in the workshop are on display at Philips booth at the NECA Show. Come see the bright and shiny for yourself!